In case you have a paper in your library where the main PDF file is actually a supplemental PDF file and you want to add a new primary PDF file to the paper, you can do it with the following steps. Select the paper in your library. Go to Paper > Attach File, or use the keyboard shortcut shift + cmd + O. Select the file that you want to use as the main PDF file and click 'Attach'. Papers shows a 'Paper already has an attached PDF' dialog. Select 'Replace current PDF with new PDF' and check 'Keep current PDF as a supplemental data'. 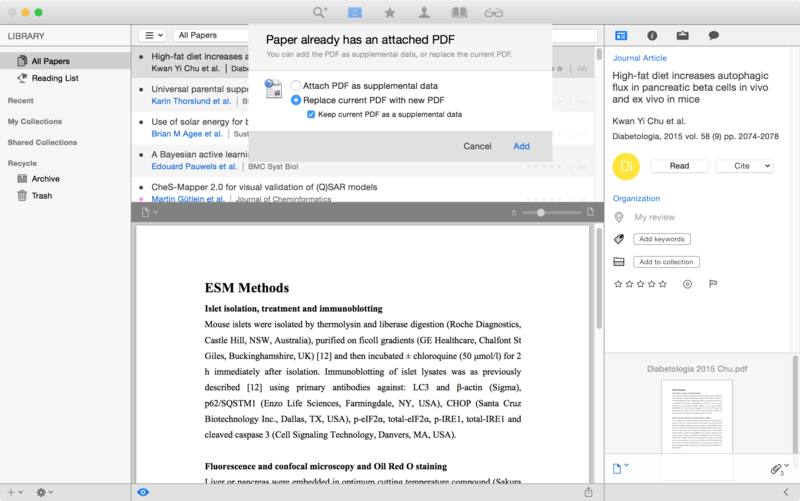 Read more about adding supplemental files on Papers for Mac.